The bullets that killed the cartoonists in Paris are just as lethal as the silence of the Muslims, in Malaysia and abroad, who have failed to condemn the killings. Their silence may not necessarily mean that they support the massacre. However, when will they begin to defend the religion, by standing up for what is right? Killing people because of a few cartoons is wrong. Prophet Muhammad would be very cross that Muslims are killing in his name, but the silent Muslims appear to be more afraid of what their fellow Muslims think of them. Today, the deranged men, who use religion as an excuse to kill, are targeting cartoonists and journalists; but how long will it be, before they attack liberal or progressive Muslims? Who knows if one day, that you, the ordinary Muslim may be the target, because you are not conservative enough? Muslims who kill, only confirm the message that the satirists are trying to convey. In most people’s minds is an indelible image which shows the traits of Muslims: intolerant, violent reprisals, misogyny, anti-culture, anti-music and anti-arts. Muslims are seen as intolerant, despite the claim that Islam is a religion of peace. Some Muslims freely insult other religions, but become vitriolic when others criticise Islam. 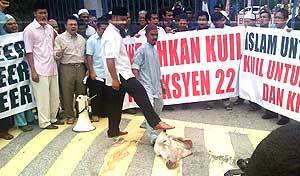 The cow-head incident in Malaysia is proof of the hypocrisy of Malaysian Muslims. Disagreeing with what is drawn, or written, does not confer the right to kill. Violent reprisals just prove, to the wider public, that Muslims only express their feelings through bloody means. The beheading of journalists in Syria by the IS fighters has blackened Islam’s reputation. The torching of churches in Kuala Lumpur and the banning of the word ‘Allah’ for use by non-Muslims helps disprove that Islam is tolerant. Muslims claim that idols are forbidden, but that does not give them the right to destroy statues of historical and archaeological significance. The rich culture and history of Afghanistan was destroyed when the Bamiyan statues were reduced to rubble. For thousands of years, these treasures withstood natural disaster and extreme weather conditions, but the Taliban destroyed them in a matter of minutes. Likewise, Islam strives to predominate in Malaysia, even though it means destroying every scrap of evidence of an older civilisation, such as the Hindu influence on Kedah’s Bujang Valley. Probably, the most shocking reaction to the killings in Paris was that “they deserved it”. No! The men did not deserve to die. 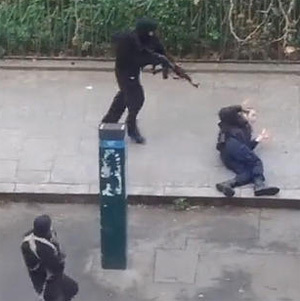 Are Muslims aware that the policeman who was mercilessly gunned down outside the Charlie Hedbo office was a Muslim? The silence of good Muslims, who refuse to publicly criticise the murders, gives the false impression that Muslims can only settle issues through violence, and not by intelligent discourse. Muslim silence allows psychopaths to murder with impunity. 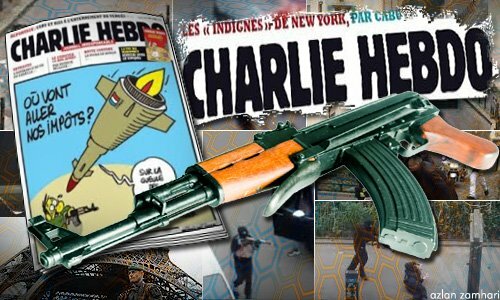 Why can’t Muslims produce drawings and cartoons to counter Charlie Hebdo’s work? Violence shows that the fanatics are intellectually deficient and are just plain bullies and mass murderers. Why has Malaysia not joined the rest of the world to organise protest rallies, in their condemnation of these terrorists? Good Muslims must learn to speak out with one voice and express their views, more frequently. Their loud silence betrays other Muslims, and Islam. Extremist groups like Perkasa, Isma, al-Qaeda, IS, the Taliban and Boko Haram grow stronger because of lack of opposition. The answer to Malaysia’s racial and religious disharmony is held by the Malays and Muslims; however, many are held back by the culture of fear. The Malays are both the problem and the solution, but they fear a charge of blasphemy, if they criticise the actions of other Muslims. It is a well established fact, that it is difficult to reach out to many Malaysian Muslims, to implore them to speak out and condemn the massacre, despite most of them being reasonable and peace loving. Will the Malays and Muslims, collectively rise up to confront the jihadis? How do we encourage them to be less afraid? The terrorists in Paris used violence to silence freedom of expression; but in Malaysia, the silence of Muslims to condemn the murders does as much damage as the fanatics. The silence of the good Muslims is a response to the fear of Umno Baru, the “defender of Islam” in Malaysia.